This article is based on extracts from his unpublished memoir, ‘The Closed Door or The Memoirs and Comments of a Local Preacher’, which he wrote in 1938. After his father’s death, the Memoir records that the family home was broken up and he moved to Oxford. He became a Local Preacher in 1912, and attended Wesley Hall, Cowley Road, Oxford. The Memoir contains a fascinating account of his early attempts at preaching. 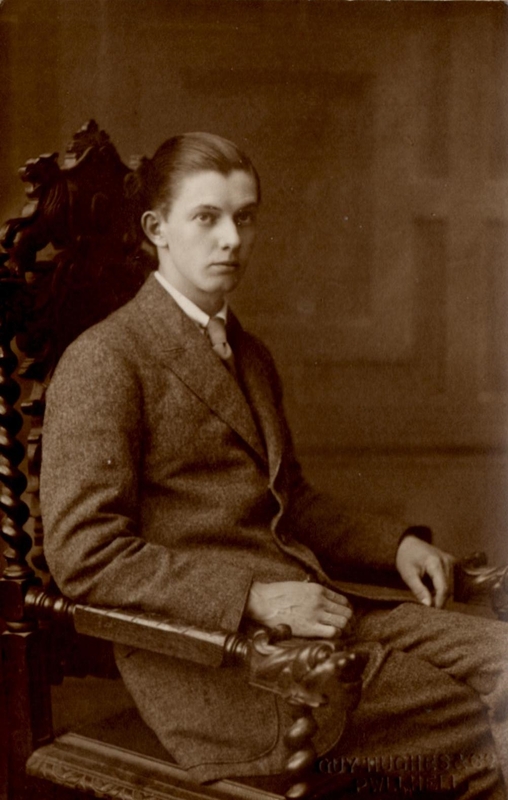 In October 1914 he went to Cliff College for a year’s study, to prepare for candidating for the ministry. ‘All this while the Great War was raging, and frequently hints and suggestions were flung out about joining the army. Mr. Chadwick was frequently urged to close down and send his men into the army. To this he replied that they would have conscription in the nation before they had it at Cliff College. Once a Brass Hat came to talk to us of the great need the nation had for men, of the great sacrifices men were making and the usual patriotic recruiting matter that was then emanating from pulpit, press and platform all over the country. Many joined up and I decided to do so too, but for some reason that I cannot explain didn’t. I wrote and told my Mother that I had decided to do so, and she replied that she was proud to think that her son was ready to fight and die for his country. After that flutter of patriotic fervour, things again returned to normal and my candidature for the ministry took its normal course. After being rejected for the ministry in July 1915, he left for London, where he found a job in the East End. ‘It was about this time that I had a letter from my devoted friend at Cliff. He was now an officer in the army in virtue of his secondary school education. What he could not understand was why I had not joined the army now that for me the ministerial examination was out of the way, while he, who was contemplating taking the exam next year, had relinquished his prospects and joined up. ‘I was terribly lonely in London, I knew none who shared my views, in fact I felt that there was no one else who was resolved to be shot as a coward and a traitor rather than to shoot and be shot at as a patriot. After a few months of this unbearable existence in London I gave up my job and before my notice had expired secured another situation in Leicester. ‘It was a strange world into which we entered. I was put into a little cell about a yard square and thought that this was where I was to spend my sentence. That however was only a reception cell. The formalities of reception lasted until after dark. It was November. These preliminaries being over we were taken in single file to our cells. We entered, in front of the warder, the long dimly lighted hall through studded door and iron gate. We were given a cloth number badge to button on to our coat. Mine was B 3.43. That is B Hall, 3rd. landing, 43 cell. While we stood at a desk receiving these I could hear a continual ‘click click up the other end of the hall that seemed to get nearer and nearer. Eventually a warder came near to where we were standing. He was looking, through the spy hole in each cell and switching out the lights, which in this prison were electric. It was an uncanny thought that came to me. “This is a living cemetery; all these little doors are graves and in each of them is a living corpse a man with like passions to myself. I am going to be buried alive in one of these graves. Some of them are going to be buried for two years. I am only going to be buried for fifty six days.” While I was indulging in this melancholy soliloquy, I found myself at the door of B 3.43, into which I was directed, and told to make my bed and get into it. I did this quickly, the light was put out, and I found myself in abysmal darkness. I slept well after an exhausting day. ‘All the days in prison are so much alike that it is impossible to distinguish one from another. The nights – as I have already said – were by far the most wonderful part of prison. My nights seemed to be filled with the most vivid dreams. I used to go home almost every night and the dream would he so realistic that it would be hard to believe that it was only a dream. I can quite believe that John Bunyan dreamt his Pilgrim’s Progress in prison. How fortunate we are that he was imprisoned in a saner age than ours, for if he had been imprisoned today he would have had nothing but a slate and a slate pencil to record his heavenly vision! What books of the New Testament might never have been written if St. Paul had been an Englishman instead of a Roman. This is a scandal. How might our literature have been enriched if writing materials were available for such prisoners as desire them? The next brightest spot in my imprisonment, after the nights, was the weekly Methodist service. This was held on Thursday afternoon. This and the Anglican service were the only occasions when we could use our voices. How wonderful it was to be able to sing praises to God with a voice that was rusting with inaction.The Methodist Chaplain was a dear old man, I never knew his name, who had spent the best of his life in India as a Missionary. He rarely preached without bringing in by way of interest something about the foreign field. One Thursday a month he came and visited us in our cells. This pleasure was conferred upon me but once. It was a memorable occasion. I was wondering why we had not been taken to Chapel when he unlocked my door and came in. I had only had warders in the cell with me before and they came to search my cell and person at all sorts of unexpected times. ‘I left Wormwood Scrubs early in 1917. They tell me there is a statue of Elizabeth Fry on the gate of that hell on earth. I was too preoccupied when I arrived to notice it, and in too big a hurry to get away to notice it when I left. I left with two other men, a Plymouth Brother and a Christadelphian. The Christadelphian had been a Methodist and changed because of the attitude of the Methodists to the war. The Plymouth Brother told him he didn’t think much of his reason! My first thought was to buy a paper; of this the Plymouth Brother did not approve on the ground that we are not of this world! … I was disappointed in my newspaper. The world seemed to be just where it was when I left it, still bent on mutual massacre … Surely war is insanity of an infectious, suicidal, homicidal character, and a pacifist conviction seems to be the only certain inoculation against it. I remember little of the journey to Wakefield except the bickering and quibbling of my two theological companions. ‘How delighted I was when I was informed that I had been chosen with several others to go to Dartmoor. We made the long and tedious journey in through coaches. Another party was already settled in from Warwick. The cells here are smaller than Wormwood Scrubs or Wakefield. That is because Dartmoor is a Penal Settlement and the convicts spend less time in their cells and more time working in the quarries, on the farm, reclaiming moorland, in the workshops, iron work, boot repairing, making mail bags, rope making, laundry, and stone breaking etc.etc. I was put on the coal cart. A party of us were harnessed to a heavy truck which we had to load up with coal and take round to various stoke holes. This was not a very pleasant occupation; another unpleasantness was that here also my cell was on the top landing and there was no wire netting to break my fall. I was still afraid of going to sleep for fear of walking in my sleep and throwing myself over the rails round the landing. ‘During this time I had done no preaching. I spoke on a few occasions in Dartmoor. I was once asked to speak in the Chapel outside but declined feeling that it would be contracting out. On one occasion the Rev. Leyton Richards, who was then Secretary of the Fellowship of Reconciliation, applied to the Home Office for permission to speak to the conscientious objectors to war service in the Prison – while we were there it was not called a prison but a settlement. His request was refused. I felt this to be a great blow and began to scratch my head to devise ways and means of getting to hear him. There was a warder who used to go round the farm with me occasionally on Sunday mornings who was a steward in the Methodist Chapel. I asked him, in an offhand manner, whether he wanted a good preacher for the Chapel Anniversary or anything special. He assured me that that was just what they did want, and did I know anybody? Well yes, I knew of a man named Richards. He’s a jolly good preacher and think I could get him if the committee thought he would do. He said he would ask them. A week or two later I asked him if he had done anything about it. Yes, he had, and the committee were willing to have him. “Some say education is the solution, some culture, and now the latest discovery in this year of grace is the sword. Well, if the sword is the world’s saviour, let us as quickly as possible turn our Churches into drill halls and. our preachers into drill sergeants.” At this the door slammed as an indication that one or two had been bowled. Not only did all the conscientious objectors who wanted to hear him get in, but the warders and their families and all the other natives of the village who wished to hear him, were there. None of these would have heard him inside the prison as they would not be allowed there. I think this was one of the most successful bits of diplomacy I had ever undertaken. Of course no one knew that I had had anything to do with it. In July 1919, W R Burwell candidated unsuccessfully for the Wesleyan Methodist ministry for the third and last time. As he could not get work, he became self-employed, setting up his own business in Leicester in 1920. W R Burwell became a LP in the Humberstone Road Circuit, to which he belonged before his arrest. In 1921 he joined the Bishop Street Circuit, to which he was still attached when he wrote his memoirs in 1938. He continued to preach about peace.